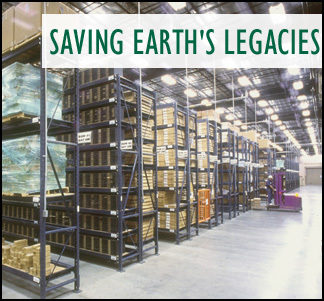 A report by the National Research Council finds that volumes of U.S. geological data and collections are at risk of being discarded or unused. National repositories are spreading as countries seek to address a common challenge. The founding collection of the Illinois State Museum was in danger of being forgotten. Collections of geological samples underpin the geological and paleontological sciences. But we face a crisis in preserving them. Footprints step back bird origins? Warm winds in the Arctic? The House and Senate have both passed versions of comprehensive energy bills. Now they must craft a compromise. A USGS wildlife study took center stage this spring as Congress debated drilling in the Arctic National Wildlife Refuge. Get this month's Energy Notes here! Petroleum companies accumulate hundreds of drill cores and other data as they explore for oil. Some of these samples of Earth's subsurface are well stored in repositories like those pictured here in the background and foreground. But not all the data find a home. Read more. The fossil pictured is the Ammonite Sphenodiscus lenticularis, Maastrichtian Stage, South Dakota. Photo by Ed Gerken for the Black Hills Institute of Geological Research Inc.